My Recommendation: It's a wonderful game full of dry, dark humor and fantastic problem solving. Both the single player and cooperative modes are great if you like puzzle platforming and disembodied robot voices quietly insulting you. 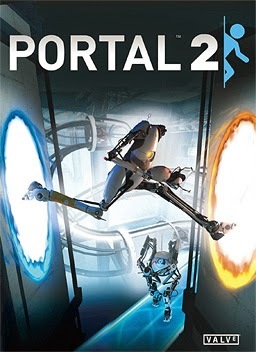 Portal 2 is the sequel to the innovative and lamentably short Portal, which was about a woman being forced to go through "testing" to please an insane AI that runs an abandoned science facility. The sequel is a continuation of that, and it's very much in the same category. The single player campaign focused on that same silent protagonist trying to escape the harrowing science facility through the use of a Portal gun. Getting this out of the way at the beginning, the game is definitely very similar to the first. 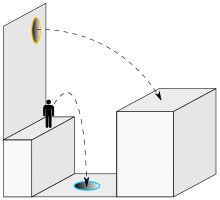 The core mechanic remains unchanged (using portals to navigate rooms that require physics and problem solving). However, there are several new features, new obstacles, and items that you encounter along your way. And the first game was extremely short. This could've been nothing but a level pack and I still would have been thrilled. 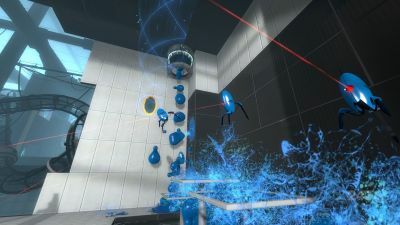 But as it is, it introduced a brand new compelling storyline, as well as a new cooperative modes that allows for 4 simultaneous portals, making the problem solving immensely more complex. There's nothing quite like dumping large quantities of "the bouncy stuff" onto surfaces. "The bouncy stuff" is the scientific name I gave it. The cooperative mode, I have to say, steals the show. It's amazing, and it was very rewarding. The level of difficulty is pretty high, but for the most part (and especially early on) the puzzle are largely based around problem solving rather than twitch portal shooting, so once you figure out a room it's not so much about execution. I'm glad that the puzzle don't require a whole lot of immediate reflexes. The teamwork required is also pretty cool. There's practically no way to advance without close and careful discussion about the path forward. Every puzzle seemed to require very exact roles and specific actions together. This is aided by an in game countdown timer you can set, as well as "look here" markers and so forth. I played locally, but given that there's online capability I'd imagine those cues could be tremendously important if you can't see your partner. The single player campaign is very reminiscent of the first game, although it obviously expands upon it greatly and takes the story in very nice directions. The puzzles are diverse and they feel fresh. The story is humorous, compelling, and the game kept me wanting more the entire time. Honestly, this is a fantastic gameplay experience, probably one of my favorites in recent history. The difficulty is unchangeable, obviously, due to the nature of the challenges, so that could be a con of the game if you find yourself getting stuck too often. But this is a really fun game, and I recommend this to pretty much anyone who like puzzle platformers, and I definitely think you should play it with a friend. If you're worried about getting stuck, try the levels and if you get stuck, there's a wiki full of walkthroughs. Let me know what you think of Portal 2!